One Headline A Day: Florida Off-Shore Drilling Yay or Nay? 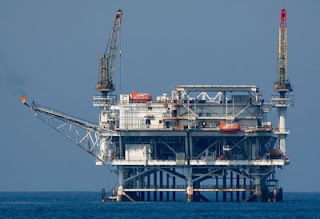 Less than a week ago, Interior Secretary Ryan Zinke announced a plan to make over 90% of National OCS program (Outer Continental Shelf Oil and Gas Leasing Program) available for OffShore Drilling. Now, the Trump Administration is exempting Florida from this plan after a high profile visit by Zinke to Tallahassee and a visit with with Governor Rick Scott, a Trump supporter. Scott had been part of a bi-partisan group of Florida officials that were critical of the original decision to expand off-shore drilling. The decision to exclude Florida from expanded drilling has left political leaders from both parties asking, "Why Not Us" as reported in the Washington Post. This negative response from both parties adds one more challenge for Republicans in a mid-term election year. ZINKE'S DRILLING MOVE HITS OPPOSITION: Interior Secretary Ryan Zinke is catching criticism from numerous corners over his decision late Tuesday to take Florida off the table for offshore drilling. While Florida Gov. Rick Scott (R) welcomed the quick action to protect waters near his state from drilling, officials elsewhere accused Zinke of political favoritism, and wondered if opponents in other states would get the same courtesy. Scott is a close ally to the Trump administration, and is expected soon to announce his intent to run against Sen. Bill Nelson (D), a long-time drilling opponent. Florida's coasts also host Trump's "Winter White House," Mar-a-Lago. Zinke said last week he'd consider allowing drilling near all of the nation's coasts.